There are fifteen Indian Visa Application Centers (IVAC) managed by State Bank of India in Bangladesh. These are located at Indian Visa Application Centre- Dhaka ( Jamuna Future Park ), Jessore , Khulna , Mymensingh, Barisal, Sylhet, Chittagong, Rajshahi, Rangpur, Comilla, Noakhali, Brahmanbaria, Satkhira, Bogura,Thakurgoan. All categories of Indian visas are accepted on a walk in basis. Holders of Bangladeshi passports who are residing in other divisions of Bangladesh (except Chittagong division, Rajshahi division, Sylhet division, Khulna division) may apply for visa in Indian Visa Application Centre- Dhaka (Jamuna Future Park ) / IVAC, Mymensingh/ IVAC, Jessore/ IVAC, Barisal Holders who are residents of Chittagong divisions may apply for visa in IVAC, Chittagong. Bangladeshi nationals residing in Rajshahi division may apply for visa in IVAC, Rajshahi / IVAC, Rangpur. Comilla, Noakhali, Brahmanbaria, Satkhira, Bogura,Thakurgoan living applicants can apply from their districts indian visa application centers. Bangladeshi nationals residing in Sylhet division may apply for visa in IVAC, Sylhet. Bangladeshi nationals residing in Khulna division may apply for visa in IVAC, Khulna. Other foreign nationals can apply for visa at Indian Visa Application Centre- Dhaka (Jamuna Future Park ) and at Indian Visa Application Centre, Chittagong. There is no visa fee for Bangladeshi passport holders applying for Indian visa. Other foreign nationals are required to pay visa fee unless they are exempt from payment of visa fee under orders of Government of India. 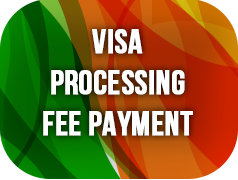 All persons applying for visa at any IVAC in Bangladesh is required to pay Visa Processing Fee (VPF). Any member of the family is allowed to submit visa applications & collect passport on behalf of other members of family subject to proof of identification by original passport. For the purpose family constitutes spouse, children and parents. Suffer from any life threatening contagious disease. Suffer from mental illness and travelling to India for purposes other than medical treatment. are addicted to or have trafficked in narcotics. have been convicted for or have criminal charges outstanding in any country. have been deported or expelled from any country. or any other grounds as in the opinion of concerned authorities that would render the applicant ineligible for visa, not necessarily to be conveyed to the applicant orally or to be recorded in writing. Delivery of Passports :- For delivery of passport may be collected on or after the delivery date which is mentioned in the receipt during the delivery time. In case of lost of receipt, applicant needs to do General Dairy at Local Police station. Passport will be delivered after submitting original copy of General Dairy (GD) ,1 photo with an application at the counter. Your entry into India even after holding a valid visa may be prohibited if the visa was obtained by false representation or by concealment of relevant facts, whether or not you were aware of those facts. You must leave India on expiry of the authorised period of stay unless the period is extended by the concerned authority in India. 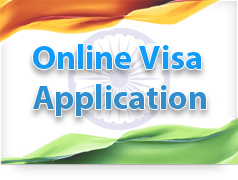 The following categories of applicants may apply for visa online and submit their online visa applications in person or through authorised representative at the High Commission of India, Dhaka between 1000 hrs to 1300 hrs on working days. The applicants must fill-up online application form and such applications will be admitted even if the date of appointment falls later than the date of submitting the application at the High Commission. (i) Officials of Government of People's Republic of Bangladesh travelling to India for official purpose- Their applications must be accompanied by Note Verbal from Ministry of Foreign Affairs, Government of People's Republic of Bangladesh. (ii) Diplomatic /Official Passport holders of other Countries (who are otherwise required to obtain visa for travel to India) travelling to India for official purpose - Their applications must be accompanied by a Note Verbal from the respective Diplomatic Mission. (iii) Personnel working in United Nations and other International organisations travelling to India for official purpose- Their applications must be accompanied by a Note Verbal from the respective Office. All categories of Indian visas, are accepted on a walk in basis. Foreign nationals, other than those who are employed/residing in Bangladesh, are advised to obtain visa from the Indian Mission /Post located in their country of origin or normal residence. IVAC Dhaka ( Jamuna Future Park ) / IVAC, Chittagong will normally accept request for visa from foreign nationals who are employed /residing in Bangladesh. Pakistani nationals are required to submit 3 copies of the visa application besides the original application along with 4 photographs. Visa fee, once paid, cannot be refunded even if the application is withdrawn or the visa is refused (Click here for Visa Fee Schedule). Need to fill up Bangladeshi address in Present address columns & in Permanent address columns of Online Visa Application fill up as per passport. to be submitted. Bring Photocopy of Bangladeshi Visa, First page of Passport & Last Indian Visa (if) along with Online Visa Application. Passport Deposit time - 08.00 to 13.00 hrs & Delivery time - 15.30 to 17.00 hrs. Online Application required documents may be submitted at the following addresses in person. The application form should be submitted at the IVAC center within 10 days of filling up the form. The visa processing time may be longer & sufficient remnant period of Bangladeshi visa validity is in place. Business visa/employment visa can be applied for only if the stay in Bangladesh is more than 2 years. Delivery of Passports :- For delivery of passport may be collected on or after the delivery date which is mentioned in the receipt. In case of lost of receipt during the delivery time , applicant needs to do General Dairy at Local Police station. Passport will be delivered after submitting original copy of General Dairy (GD) ,1 photo with an application at the counter.